SpectorSoft Server Manager monitors, alerts and responds to critical server events, all from the convenience of a single console. Monitor, consolidate, archive, audit and report on logs in real-time from Windows server event logs, Syslogs and text files with EVENT LOG MANAGEMENT. Ensure maximum uptime by monitoring and controlling Windows services, applications and processes with APPLICATION MONITORING. Centrally monitor server resources such as CPU and memory network-wide with RESOURCE MONITORING. Monitor, predict and manage disk space utilization with DISK MONITORING. AggreGate Network Manager is an enterprise-grade network management platform. The system provides a rich set of data processing tools for monitoring IP networks, servers, routers, applications, services, traffic and performance. Its features include discovery, mapping, alerts, event filtering, charting, reporting, grouped operations, replication, task scheduler, custom widgets, query and expression languages, and more. Dacris Benchmarks is a performance testing utility allowing administrators to easily benchmark an entire network of computers using a series of tests as well as system information. It is portable and highly accurate. After testing, you can also compare test results with a vast online result database. SolarWinds Engineer’s Toolset includes a collection of powerful network management tools, all of which can be easily accessed through an innovative Workspace Studio to quickly resolve issues right from your desktop. With the Workspace Studio, you can organize your tools to tackle troubleshooting challenges and then recall that workspace with a click when you need it – saving valuable set-up time. And shared credential management saves even more time as you switch easily between the tools you need without re-entering credentials. Take control of your day and your network with powerful, timesaving features, including: Monitor and alert in real time on network availability and health with tools including Real-Time Interface Monitor, SNMP Real-Time Graph, and Advanced CPU Load. Learn more or download a free fully functioning 30-day trial. ipMonitor delivers availability monitoring so that you always know what’s happening with your applications, servers, and network devices. With a built-in database and Web server, you don’t need to install anything but ipMonitor. 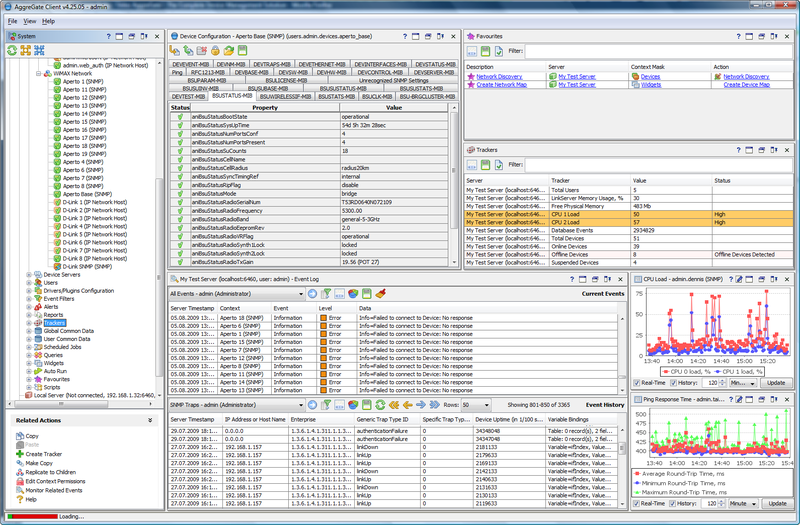 ipMonitor simplifies network management by discovering IP-based network devices and automatically recommending monitoring settings for each device; performing monitoring of Active Directory, DNS, Microsoft Exchange, FTP, Web, IMAP, MS SQL Server, SMTP, and others; monitoring end-user experience with synthetic transactions; and more! Learn more or download a free fully functioning free 30-day trial. SolarWinds Network Performance Monitor (NPM) enables you to quickly detect, diagnose, and resolve network performance problems and outages. Out-of-the-box, it offers network-centric views that are designed to deliver the critical information network engineers need. And SolarWinds NPM is the easiest product of its kind to use and maintain, meaning you will spend more time actually managing networks, not supporting SolarWinds NPM. NPM provides comprehensive performance, fault management and network availability tools to ensure that your network is always running at peak performance. Via a cutting-edge web interface, NPM gives you a unified view into the performance of thousands of nodes and interfaces on your network. From a single web page, you can monitor performance metrics from any SNMP-enabled device, including routers, switches, firewalls and servers. Commonly monitored metrics include bandwidth utilization, packet loss, latency, errors, discards and quality of service. Spiceworks will provide a free TFTP server tool for Network Configuration Management as part of their upcoming free IT management software suite, Spiceworks 5.0 (available Sept. 2010). For now, download Spiceworks 4.7 now, featuring a state-of-the-art, full-featured help desk, network monitoring tools, troubleshooting fixes, software audit and inventory tools, and more. Once Spiceworks 5.0 is live with free TFTP server for network config, you’ll be the first to know how to grab the update. Download today – and share with your peers!